It’s cherry blossom season, but this years’ celebrations will be subdued and somber. The ephemeral nature of this fleeting symbol of beauty has taken on a special and poignant significance in the wake of the tragic earthquake & tsunami of March 11. It has been almost month since Japan's largest natural disaster struck our beloved country. We thank all our friends for their concern, and are happy to report that our immediate family and friends are all fine. We are inspired by the people of Japan; their courage and strength during the nuclear scare; their determination to stay in the country despite potential danger; and the amazing rebuilding process, which has already begin in earnest in some areas. One of the key roads leading north was fixed in only six days! Although our friends and food industry contacts express worry about the future, with fish sales at 50% of the pre-earthquake days, they are perservering in the face of tremendous sadness and loss. We have long benefitted from the bounty of Japan's beautiful Northeast coast. They were famous for their succulent scallops, fresh wakame, and many varieties of fish. The beauty of the Matsushima coast, whose craggy rock formations recall zen rock gardens, was legendary. Intermittently dispersed among these rugged contours were peaceful fishing villages and the occasional perfect half moon beach. It was on one of these beaches that we spent a few happy and carefree days long ago, staying at a minshuku owned by a fishing family. The men were out to sea, and their wives tended to us with warmth and melting concern. I can still see thier father shaving katsuobushi in the morning, grandson in lap, sitting in the sun. I can hear the rythm of the plane, and recall the rich smoky aroma rising from the golden shavings. 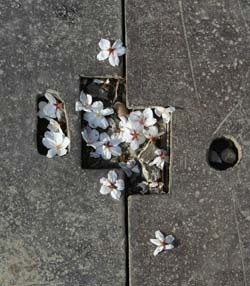 It brings me to tears to think that it is all gone, like sakura petals washed away down a river. It is daunting to think of how we can give back to such a place, how we can possibly help. Many of us have already given to disaster releif organizations such as the Japanese Red Cross and World Vision. But there are some other, more specific and personal ways you can help. Our friend Steve Beimel of Japan Living Arts, along with Esprit Travel, is organizing a Toynami: a wave of toys to send small toys to displaced childeren in northern Japan. And the Mudflat Pottery Studio is collecting donations for the Mashiko Potters Fund, which helps potters in Mashiko rebuild their kilns and workshops that were destroyed by the earthquake. We are also searching for food-related funds to help farmers and those in the food and fishing industries that have lost everything. Beyond this, we encourage you to continue to travel to Japan and continue to eat Japanese food. Most of the country is not affected by the tragedy. For those who are worried about flying through Narita, international airports at Kansai and Nagoya make easy connections to central and western Japan. Even if you were not previously considering a trip, please do so now. Japan's economy needs your tourism dollars. Of course, it's not just about money, they need your friendship and emotional support as well. And for those concerned about imported foods from Japan, please remember that they have some of the most stringent food safety measures in the world. Like the sakura that arrive every year after harsh winters, we are confident that Japan will also perservere and bloom once again. It may take a very long time, but spring will return, perhaps more resplendent and beautifully than ever before.